We’ve been raising backyard chickens in the city limits a little over a year now. Let me tell ya, when Mr. Simple first told me he wanted to get some chickens I was extremely apprehensive. You see, we live within the city limits in a subdivision with neighbors close by. I didn’t think we would be able to have chickens. Turns out, in our town we are allowed to have backyard chickens within city limits. They are supposed to be housed at least 100 feet from all residences. Our aren’t quite 100 feet from every house, but no one has complained yet. We live in an older subdivision with no homeowner’s association, so I’m grateful no one rained on our chicken parade. We’re also in the South in a somewhat rural area, so that may be part of it, too. I never had a desire to raise chickens, but I have learned they are really awesome creatures. We have five hens and ended up with one rooster. Four of our hens came from Mr. Simple’s dad who is also known as the Chicken Man. We bought some more chicks this year, but only one Barred Rock survived. Three of the Barred Rocks (black and white chickens) flew the coop and met their fate after our dog tracked them down. 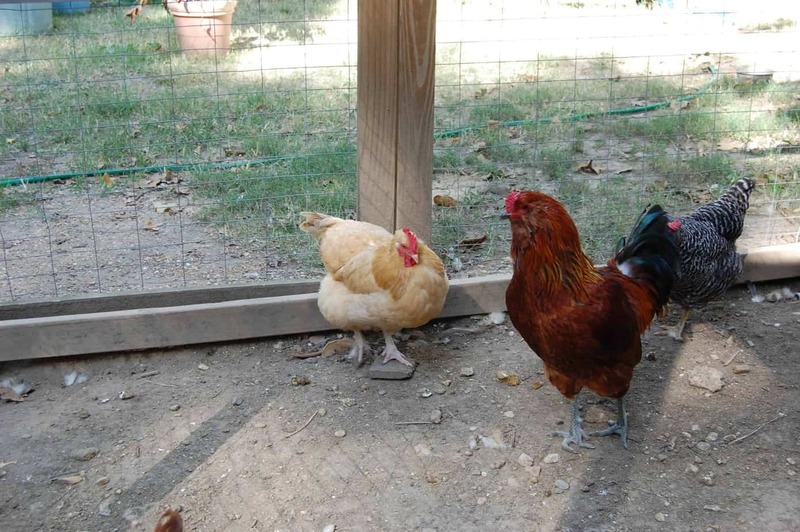 Three American Leghorn hens actually died when temps soared well over 100 degrees here, and we gave away three roosters. The final rooster was supposed to be given away, too. He is an Americana and we affectionately call him Bad Foot. Mr. Simple felt sorry for him because his toes do some weird curling thing, so he kept him. He’s actually a good little fellow and has a sweet nature for a rooster. Our Buffs are named Fluffy and Maxine and our Production Reds are Ruby and Gerty. Ms. Barred Rock is my Berta. Berta loves to peck my painted toenails, ouch! Mr. Simple built them a very large run out of some fencing, some boards and some recycled tin. We completely enclosed the run to keep neighborhood cats out. The coop is made out of an old wooden dog house. It sits high up on stilts and contains a roost and laying boxes. Sometimes the chickens lay in the box, sometimes they lay under the roost. I have grown to love my chickens. They are cheap to keep and will eat almost anything. I give them old scraps from the kitchen. We also love to let them out so they can forage on bugs and grass in our yard. It really is fun watching them peck around and play with each other. The best part about keeping backyard chickens is the fresh eggs. With five hens we can get anywhere from 1 to 5 eggs a day. We have enough for our family and enough to give away. 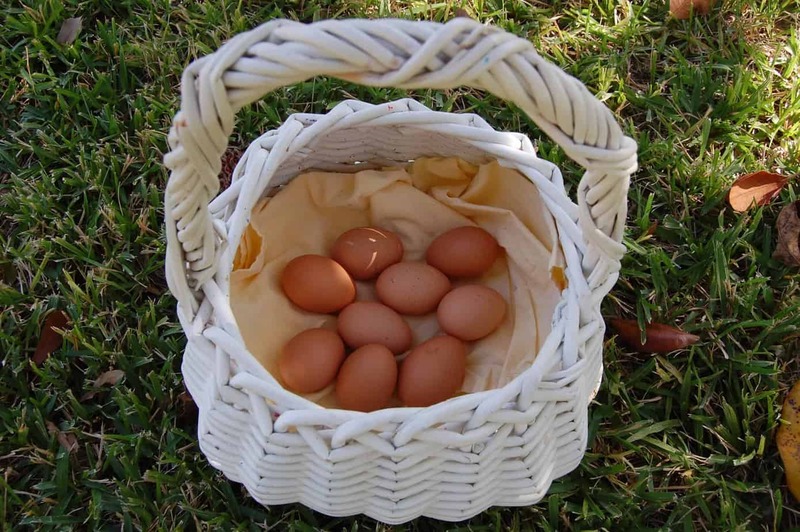 The eggs are really yummy, too, and it’s awesome knowing just what my chickens are eating and what’s in my eggs. Our backyard chickens have become our pets and they give us the satisfaction of producing something that benefits us. 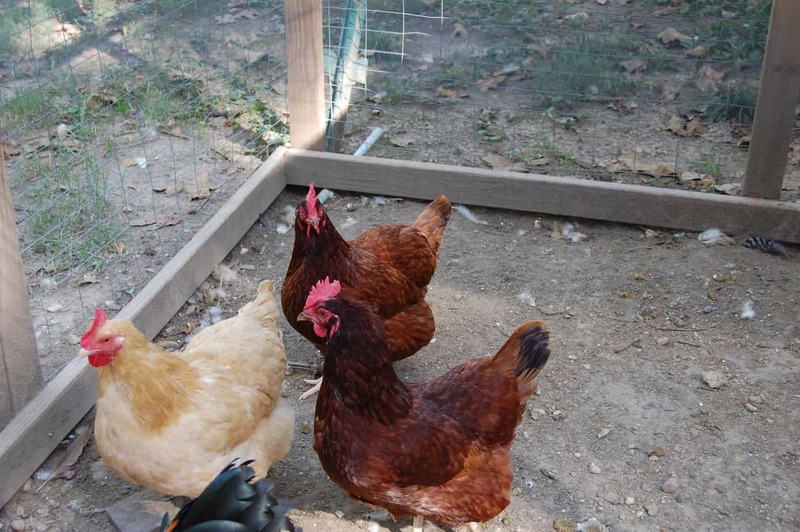 If you live in the city limits and would like to know if you can raise chickens in your backyard, just give your local code department a call and find out. You might be surprised!